Over the next several weeks, Fr. Chad will present a lecture series given by Fr. Alexander Atty on the campus of St. Vladimir's during the annual Lenten Retreat. Fr. Alexander is priest at St. Michael's Antiochian Orthodox Church in Louisville, KY. He will be speaking on the Good and Faithful Priest, Parishioner, and Parish. Fr. Alexander Atty continues his talk on the Good and Faithful Priest, a presentation given at the 2009 Lenten Retreat at St. Vladimir's. Fr. Alexander Atty concludes his lecture on the Good and Faithful Priest. Next week he will begin talking about the Good and Faithful Parishioner. Fr. Chad Hatfield: When the Special Events Committee met and we said, “Okay, for this year’s public retreat, what is it that we really want to present for the public?” and we all decided that we needed someone in here who could really inspire us to step up our spiritual life that reflects what it means to be an Orthodox Christian living in 2009… We live in a materialistic culture. We are a consumer culture, and there’s a reason why Burger King doesn’t put its hamburgers in a McDonald’s box. That’s because Burger King is Burger King and McDonald’s is McDonald’s. And we Orthodox Christians have gotten over trying to imitate somebody else. Finally, we’re maturing enough in this country that we don’t have to imitate how anybody else is, and we’re rediscovering what it means for us to be an Orthodox Christian. The eminent Lutheran theologian, Martin Marty, has said that this should be the century for Orthodox Christians, because an anemic Western Christianity is losing ground fast, and people are looking for something that is solid and significantly able to change their lives. That Lutheran theologian pointed to Orthodoxy, but I have to tell you: we’re about to close on the first decade of that century that he’s pointing to, and I’m not so sure that our scorecard looks very good at this point. That doesn’t mean that we give up. That means that we come to an event like today, and we make that personal effort, when we go home, from what we learned today. So, to achieve that, we all said, “So who do we need?” It was almost unanimous at that table: “We need Fr. Alexander Atty to come up from St. Michael’s, Louisville.” And instantly, there was an agreement. So we, as a committee, said, “This is the priest that we want to come and talk about: what does it mean to be a good pastor, to be a good parishioner, and to be a good parish?” Because in his life, in his priesthood, he demonstrates that as a man, and he demonstrates that as a family, and in his community. A few years ago, The Word magazine featured his parish as one that [was] an exemplary parish that all of us should strive to imitate, and I don’t say that to embarrass Fr. Atty, because I know him. He’s been a brother and friend and a mentor in many ways to me. But I say that because he just has a message to share, and he does it so well. He’s a systems guy by training, and one of his contributions as a graduate of St. Vladimir’s Seminary is [that] he helped us move from the cave-man days when we used to have ropes and walls and boxes for our shipping, [and] we’d pull them over: he’s the man credited with introducing St. Vladimir’s Seminary to UPS! Fr. Atty is not only a graduate of St. Vladimir’s Seminary, but he also earned the Doctor of Ministry degree from Pittsburgh Theological Seminary in the Eastern Christian context, and he serves as a trustee of our sister seminary in South Canaan, PA: St. Tikhon’s. So without any more ado, I give you Fr. Alexander Atty, and welcome home, Fr. Alexander. Fr. Alexander Atty: Thank you. Thank you, Fr. Chad. I’m not all what he says I am. I’m going to make that quite clear right now. 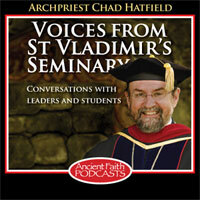 Thirty years ago I graduated from St. Vladimir’s Seminary. I grew up in a coal mining town in western Pennsylvania, which we called “Pennslavnia,” growing up. I was blessed to have great parents who were visionaries as Orthodox. I was baptized in what we called the Syrian church, in Johnstown, PA, where Fr. George Alberts was baptized also. We moved to eastern Pennsylvania when I was a freshman in high school, and there was no Antiochian church within 60 miles of us, but my parents were one of those kind of people that says, “We go to the closest Orthodox church.” So for the next eight or ten years, I spent my developing years as an Orthodox in a Carpatho-Russian OCA church in St. Clair, PA. My heart’s still there. And then I came… I went to engineering school, worked as an engineer for three years, but always felt the calling to go to seminary. And I looked at both schools and decided to come here. The main reason was: I got a scholarship here from the Antiochian church. I went with the money! But it was a blessing. At the time, when I was here, Fr. Alexander Schmemann was the dean; Fr. John Meyendorff was here, Professor Kesich, Professor Verhovskoy. And these were guys that had that Old Country tradition in them. And, by the way, there’s nothing wrong with the Old Country tradition. That’s the blueprint of our faith. It doesn’t mean you have to be ethnic, you know. I get tired of the “cradle versus convert” discussions. They’re fruitless. [All] of us are converts, and some of us have to be reconverted. Those who were blessed to be baptized in the Faith, they should ... We need a reconversion, a renewal of spirit and of heart. I have really three talks to do today, and all of them, I don’t… I can’t say I’m a good and faithful pastor. I can’t say that. I was molded by some very good people. I credit my spiritual depth to the fact that I had an Athonite father as a spiritual father. He was my spiritual father. He was a monk on Mt. Athos. There was no compromise in his approach to the Faith. [In] 1979, I was ordained a priest at St. Nicholas Cathedral here in Brooklyn, and I was shipped to my first parish in Louisville, KY, a parish of 200-and-some people at that time. Oh, by the way, did I tell you I married a Russian? That was my second baptism! I married Fr. John Nehrebecki’s daughter, if you know him, and I’m 763 miles from them, so it’s a safe distance. They are very good people, by the way. I don’t want you to learn that from this discussion! But all that’s added to what I feel that’s the shaping of my priesthood, and I also have that stubborn principle in me as a priest. My parents were very principled people. Money wasn’t ever the object of their quest. Principle was. So all that was added to my shoulders, and when I went to Louisville, KY, there was a parish there of 200-and-some people, and a remarkable building. It’s a building that holds approximately 800-900 people. They had an empty community. They did 50 Sunday services a year. When the priest went away on vacation, they closed the place. They never knew what Saturday night vespers was. The Great Fast was limited to an akathistos on Fridays, as long as it didn’t interrupt the bingo program. I don’t say that out of criticism for them. Sometimes our churches are our fault, as priests. When our parishes have bad habits, it’s our fault to allow it to continue. They were very manageable people, because they saw the end of their parish. The average Sunday attendance was 50, 60, 70. When you have a complex like they had, on ten acres, they were going broke. And the knee-jerk reaction is, as a priest, to make yourself comfortable. My spiritual father says that’s a big illness among clergy in America: to be comfortable. And I went there… I didn’t get paid for two months, by the way. They didn’t have the money. I had a resourceful wife. She taught school. She still saves me. She’s our choir director; she’s my right hand. And it takes a long time. A lot of priests will come down to Louisville today, and they think it’s Disney World, because of its beauty and the liturgical life that we have. We have church twice a day. We built a free-standing chapel there for the edification of our people. Unlike the Baptist churches and the Protestant churches… You know, you drive down the street and you see a Baptist church; you see these huge educational buildings and medium-sized churches. Our education begins in the church, and ends in the church. That’s what my spiritual father taught me. He said to me when I first went there [and asked,] “What do I do?” He says, “You do what the Church has always done. You pray. You worship. You feed your sheep.” And I think one of my earlier challenges was to eliminate meat during the fasting periods. I said they had bingo. Well, they were respectful during Holy Week; they didn’t have bingo during Holy Week. And they had fried-chicken dinners every week, no matter what period of time it was. So, naturally, when I moved south, I had one of my old parishioners say, “Geez, this guy came in here like Sherman went to Atlanta!” Well, because it was an immediate stop. I had the philosophy… Everybody says a priest should go in and take his time and be patient. I have a real philosophy about that, and that’s: If I went to a surgeon and I had a tumor in me, and he said, “You have a problem here. You need surgery.” Would I wait a year, or would I cut it out and then work on my recovery? Well, I didn’t wait the year. Serious business had to take place, or St. Michael’s would have been on the auction block. It was at the crossroads of its spiritual life. A lot of people think that you’re a dictator, then, when you decide that you’re going to preach the Gospel and go by what the Church Fathers have taught us for centuries. And all the words of our Church are unpolluted. They’re unpolluted. Not to condemn anything, but everybody’s thinking that they have to reinvent the wheel theologically. You know what’s new? Nothing. What’s really new is to learn who we are and where we came from and apply that to our pastorate. I think a lot about my early days as a priest. I went to a parish… By the way, in addition to having only 50-60 people on a Sunday in a dying, shrinking community, I was priest number 25 in its 46-year history. Fr. Schmemann said to me, “Your first job is to replace the revolving door on the rectory.” He knew, the priests up here knew that Louisville, KY, was a problem parish. I think all it needed was a little discipline. Bad word in American society. We’re not allowed to use those words: discipline, sin, repentance. That goes against the American grain. But those kind of things had to start. And when I analyze the topic today, “good and faithful pastor,” at this point in my life, I don’t know if I’m a good and faithful pastor. I don’t know if I’m a good husband. I don’t know if I’m a good father to my children. That’s going to be when the clock runs out at the final buzzer, and when I’m judged, we’ll find out. But I have that conscience in me that was given to me by the fathers up here and the Athonite tradition which, though I’m a married priest, I’m very much a monk in my own heart, just with my spiritual father’s advice to me: “You’re a married priest, but have a monk’s heart.” And a monk’s heart is one of prayer and worship. And so, somehow or another, that’s been instilled in me, and I approach my parish in that manner. Some of the things I feel [are] necessary for younger pastors today [are]... Sometimes we’re confused. Election time, all the politicians sound like… I think we have our roles reversed. I listen to some of the TV evangelists, and they sound like they’re running for office, and then some of our politicians sound like they’re in the pulpit. The Church has to… Priests… We all have that problem, by the way. You know? We have the Messiah complex where we think that just because we show up and we’re going to knock on someone’s door they’re going to be in church the next Sunday. That doesn’t work. It helps, but it doesn’t work. The other thing there is that we all want to be popular. All of our clergy want to be loved and be popular. And that’s all in us because that’s human nature. We want to be loved. Sometimes we want to be loved at the expense of teaching the truth, though, and if your people really want to love their priest, they should pray that he does preach and teach the Truth. Someone told me this morning—and I’m not going to give his name out; I don’t want him court-martialled—he told me that the four problems facing America today, the American Orthodox church [are]: beards, ponytails, sandals, and cassocks. Well, two out of four I’m guilty of. I can’t grow a ponytail, and I don’t have sandals. But what’s really facing the American church today is the fact that we’re not of one mind and one heart, and our clergy aren’t even united. I’m really [saddened] by that, because when I was first ordained, I looked at all priests as my brothers. All of them. I don’t care if they’re Greek, Chinese, Ethiopian, Ukrainian, OCA, whatever. I felt like it’s time we be one church in this country. One Orthodox church. And to be honest with you, that’s how I shaped my community. If you walked into St. Michael’s and you didn’t hear the bishop’s name, you would know you were an Orthodox church, but you wouldn’t know which flavor, because that’s not important. What’s important is that we, we as priests, we serve our communities with our whole being, our whole heart, not afraid to work, not afraid to get up real early in the morning. We have matins every morning at St. Michael’s at 7:00 a.m. I’m up at the crack of dawn. It was easier when I had my German shepherd, because he woke me up, but he died and now I have to get up with an alarm. But all those things added into what makes the Church be what it’s supposed to be. Now when it comes to being a good and faithful pastor—which I am not! I’m hoping one day that the Lord will tell me I am. But what the good and faithful pastor has to do is… First of all, everything we ever want to know about the role and the function of a priest is found in the worship of the Church. Just a small example: the Liturgy of St. Basil the Great which we celebrate the Sundays of the Great Fast and on St. Basil’s Day, all those prayers that we skip… You know, everybody walks into church like this: they look at their watch. We’re on the border of Central Standard Time, Louisville is, so I always tell them, “Just assume we went from East to Central. Throw away your watch, in other words.” All those prayers that we read that a lot of liturgical renovators want to [take out of] the Church because it might take an extra fifteen minutes are the most important prayers that give your understanding and my understanding of the role and function of a priest. We remember the people here present and those who are absent with just cause. Preserve their marriages in peace and harmony. Nurture the infants. Instruct the youth. Strengthen the aged. Give courage to the faint-hearted. Reunite those separated. Bring back those in error and unite them to Your holy, catholic, and apostolic Church. Free those who are held captive by unclean spirits. Defend the widows. Protect the orphans. Liberate the captives. Heal the sick. Pray for all classes of people, especially for those in every kind of affliction or distress, those who love us and those who hate us, those who’ve asked us to pray for them, unworthy though we be. And remember the poor. This is all expressed in the Liturgy of St. Basil the Great, the kind of prayers that some people want us to just eliminate, but when I read those prayers—and I read all my prayers out loud—I often think to myself, “This is our command! This is [Whom] we work for!” Quite honestly, I don’t work for my bishop. No offense. I love him. I work for Him. It’s His Church. We’re just stewards. We’re not owners; we’re stewards. When I’m praying these prayers in the Liturgy, and I have to look and think of ... everybody in my parish rushes through my head sometimes, especially the people who are at home that should be there. The people who are sick, the people who are dying, the people who have trauma in their lives, problems with their kids, all these kinds of [things], marriages on the rocks. It’s odd how they flood through your brain while you’re saying these prayers, which means that they need our prayers. And for us to skip stuff like that already shows the depth of the priest. I’m not the brightest guy in the world, by the way. I’m not smart, but I feel like you don’t have to be a good theologian to be a good priest. Theologians are “up here.” I wouldn’t make it “up here.” But theologians… You know, there’s a saying: “A theologian is one who prays, and one who prays is a theologian.” But as the shepherd of the local flock, I think you have to put your heart there. You can’t legislate pastorate. These guys’ll teach pastoral theology up here, and blah-blah blah-blah blah-blah-blah, but you can’t legislate it. You could teach someone to drive a car. They could be a good driver or a bad driver. It’s the same way with being a priest. If there isn’t something in you to begin with, which is the calling, and the calling takes many forms… I felt called. I thought I was going to be a priest since I was in the third grade, but I told my parents I wanted to be a Catholic priest. Because their church was orderly! My neighbors were Roman Catholics, growing up in western Pennsylvania, and I’d walk in their church and nobody was late; nobody talked; nobody left early; coffee hour wasn’t the most important thing. And I thought, “That’s the kind of church I want.” Because I went to a church… And I love my home parish, by the way, but there [were] times that during the Great Entrance when I was a kid, when there was competition with the priest getting around there and someone wanting to light a candle. They almost knocked him over! And they were oblivious to it! And then the whole back row was people talking and all that other nonsense that I still don’t like. So, yeah, all those things were part of it, that calling. And the calling always stayed there, because I went to church in spite of the church. I didn’t hear the Creed in English till I was 21. You would have thought I grew up overseas, but they didn’t do it. When I went to confession in St. Clair, PA, the priest was an immigrant from there. He was an older guy. He was in his 80s when he retired. He had a typed-up list, a checklist of your sins, in English. So you’d say, “I did numbers one, seven, and eleven.” Today I’d win the lottery. But that was still a calling. I went to church for eight years without English, but yet the Church permeated my being. And I looked around one day and said I needed to go. It took me three years to make up my mind to go to seminary. Every day I was going, and every night I wasn’t. And then my mother finally says, “Go! Get it out of your system!” I did. I quit a very high-paying position. When I went to seminary in 1976, I was chief engineer for a firm called Vanity Fair Corporation in Reading, PA. They made women’s lingerie, Christian Dior hosiery, Lee jeans. My whole family loved that job! But I quit in August of ‘76 to go to St. Vladimir’s, and my W-2 form that year was $62,000: the first eight months of the year. I made a great living. My brother told me I was crazy when I went to be a priest. And my mother did, too, because they felt… My mother said they never treated priests right, and I said, “Mom, times have changed.” Now they treat him worse! So, needless to say, I think when you have a calling, you’re going to endure, and the last thing I was going to do as a priest was compromise on this Church. I will not do that. Even if they ship me to Siberia—and Louisville was Siberia at one time. And that’s one of the other pieces of advice that Fr. Schmemann gave me. He said—he always called me by my last name—“Atty, you go down there, make your parish Paradise.” Don’t look at anybody else’s church. Don’t look at it. Make your own. And for me, St. Michael’s is paradise. It has its problems, but it’s still Paradise for me, and it’s continuing its ministry on a daily basis. We went from 200-and-some people; probably around the 900-member mark now. And a mosaic of everybody. The church is a reflection of God’s kingdom: all colors, all nationalities, all ethnicities: you name it. And I think it all comes from what the Church Fathers prescribe, and what the role of a pastor is all about, and that’s to feed the sheep. Feed the sheep.